23. Stopes, Marie. Works 1910~13. 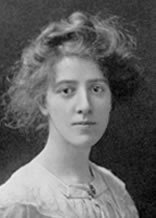 Marie Stopes, from the frontispiece of A Journal from Japan, 1910. Image: . Left: title page of Plays of Old Japan, a major conceptual source for both Pound and Yeats, although scarcely acknowledged in the secondary scholarship of either. 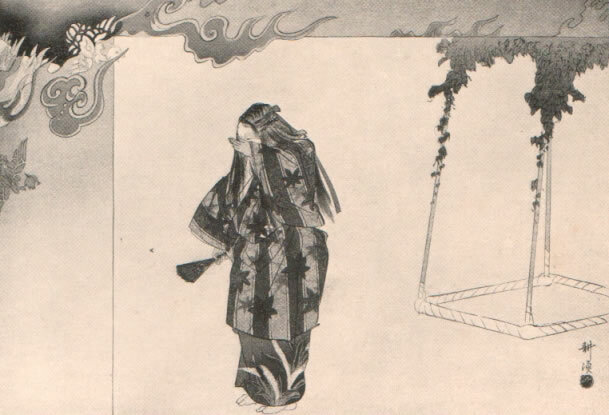 Right: Motomezuka surrounded by flames, in ‘the elaborate dance of her agony’ (the line is from Yeats), an image that returned to Yeats throughout his life when his thoughts turned to the passionate dead and the ‘dreaming back’ of the pain from which they have not been released: ‘blood begotten spirits come / And all complexities of fury leave, / Dying into dance, / . . . / An agony of flame that cannot singe a sleeve’. Pound and Yeats read Stopes and Jôji Sakurai’s Plays of Old Japan: The ‘Nô’ (London: Heinemann, 1913) at Stone Cottage while they worked on their own versions of the nô from Fenollosa’s manuscripts. Pound twice credits Stopes’s work in print (BK13a, 17a), though privately wrote to Harriet Monroe that the early English translations of the nô were ‘dull and ludicrous’ (BK59b). What he does not mention either in public or private, but what Stopes herself recalled years later, is that on the basis of her work Pound had solicited her help in his own versions of the nô, but that she refused him, because ‘he knew nothing whatever about the subject’ (see BK152). Plays of Old Japan includes lengthy and largely accurate notes about the nô, translation of SUMIDAGAWA, MOTOMEZUKA (here called THE MAIDEN’S TOMB) and KAGEKIYO (see BK21a), and an ‘English Bibliography of the Nô’ that cites earlier work by Dickins (D3), Chamberlain (D5), Aston (D13), Brinkley (D14), and Sansom (D22). MOTOMEZUKA, particularly, stayed with Yeats, who turned to the play often in support of his idea of the universality of the ‘dreaming back of the dead’ (BL13, 15a, 17b, 38b2, and see also 57h) and perhaps drew from it in poems such as AMONG SCHOOL CHILDREN (BL29, and see BL148) and BYZANTIUM (BL32a, and see BL97 and 98). Plays of Old Japan provided as well source material for Craig (see D17a4) and was in Rexroth’s library (see CB5), and is acknowledged in one of Empson’s few comments on the Japanese theatre (BF8). Oddly, SUMIDAGAWA, the play upon which Plomer based the libretto for Britten’s ‘church opera’ CURLEW RIVER (BJ18), first staged at the Aldeburgh Festival in 1964, was in Stopes and Sakurai’s version the libretto for Clarence Raybould’s opera performed at the Glastonbury Festival in 1913. 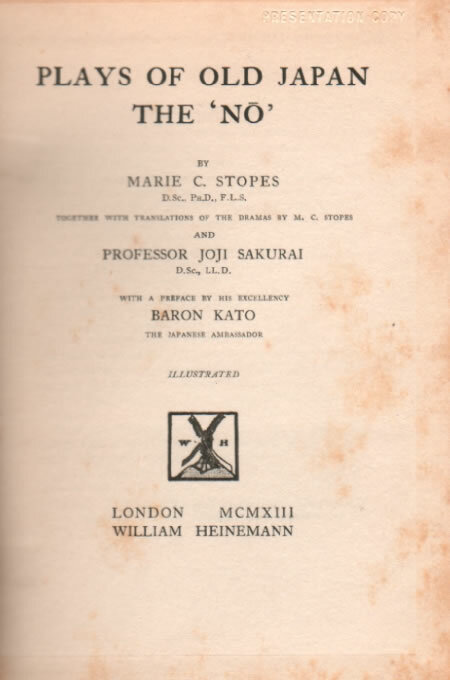 Stopes’s earlier work drawn from her travels in Japan, A Journal from Japan: A Daily Record of Life as Seen by a Scientist (London: Blackie, 1910), largely relates journeys to remote parts of the country, but includes as well an account of a visit to the nô. Blunden’s letters to Stopes are held in the British Library (see BD171d). See also Carmen Blacker, ‘Marie Stopes and Japan’, in Cortazzi and Daniels (CC8), and A24, 36, BK95, 149, and BL102.